Facebook is one of the best modes of online marketing for your business, and if you haven’t yet adopted a Facebook strategy, you could be missing out on tons of sales. Consider that 68 percent of Americans use Facebook, which means that when you implement a Facebook marketing strategy, your business has access to an extremely expansive pool of potential customers. Not only that, but a staggering 78 percent of American consumers have discovered retail products that they planned to purchase while surfing Facebook. If that doesn’t entice you to implement a simple Facebook marketing strategy for your business, we’re not sure what will! One of the biggest reasons businesses don’t adopt a Facebook marketing strategy is out of fear that it’s complicated to create, or that it won’t yield results. However, both assumptions are incorrect. On this page, we’ll provide you with a social media marketing plan template for Facebook so that you have no more excuses for missing out on tons of sales driven by the social media giant. You’ll love our simple Facebook marketing strategy, so read on! If you’re a fan of simple, you’re in the right place. Creating a Facebook strategy doesn’t have to be difficult. In fact, it can actually be quite straightforward, basic, and unsophisticated while still driving insane results for your business. Our template begins assuming that you already have a Facebook profile for your business. If not, signing up is free! Just visit Facebook’s website and sign up for your account. Something that businesses often get hung up on is the number of followers they have. Though this is important for growing your brand awareness, something that is far more important than the number of followers you have is the number of conversions you make from the platform. We know what you’re thinking: “How do I get more conversions without thousands of followers?” The truth is, you don’t have to have thousands of followers to make more conversions — you just have to attract high-quality followers that are truly interested in your products and services. To do so, you’ll want to post informational content, share beneficial videos, and link users to your website. All of these Facebook strategies can help you accomplish your true goal, which is more customers and conversions. If you’re wondering why our second tip is to invite users to like your page when we just explained why follower count isn’t all that matters, hang tight. Your main concentration should be attracting high-quality followers to your account by posting fantastic content and sharing links to your website. However, as long as you know that that’s your main goal, increasing your followers to help with brand awareness can be beneficial. When someone chooses to follow your page, it means they’ll get updates every time you post something to your timeline. You could say that attracting followers is part of the secret sauce — if you want people to see your products, services, and content every time you post, they have to follow you first. Of course, it’s possible for you to gain followers without inviting users, and you will. However, if you want to accelerate the process and gain more followers in a short amount of time, invite them to like or follow your page! 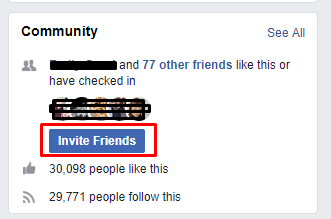 Everyone that accepts your invite will then become a follower, which means they’ll see your content every time you post. Keep in mind that your reach can be far beyond your followers. For example, if one of your followers shares a blog that you post from your website, their friends will be able to see it too. Not only does this provide potential for more website visits, but more followers to regularly see your content. After increasing your following, it’s only right to post content that they want to see. The only way to ensure that you get high engagement on your Facebook posts is to post things that your followers are interested in. Links to your blog: When you post links to your blog, it benefits you in more ways than one. Not only do you increase traffic to your company’s website, but you also provide users with beneficial information. Eventually, users will start to see you as an industry leader, and someone who knows their craft when you consistently post informational, beneficial information that users will learn from. Videos about your industry: Video content is more important than ever. Did you know that a Facebook executive predicted that the platform will consist of all video and no text by the year 2021? That’s pretty incredible to think about and should definitely get your wheels turning if you don’t already post videos to your Facebook account. Not only that, but Facebook has over 8 billion video views per day — speaking again to their popularity and effectiveness. 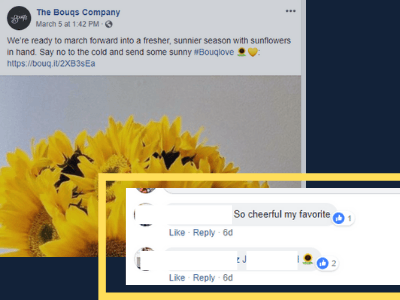 Images and introductions to your staff: In order to really connect with your audience on Facebook, you want to be as personable and humanistic as possible. You can help users get to know your brand better by posting pictures of your staff members, what they do at your company, and a quirky fact like their favorite flower (or a fact relating to your company). 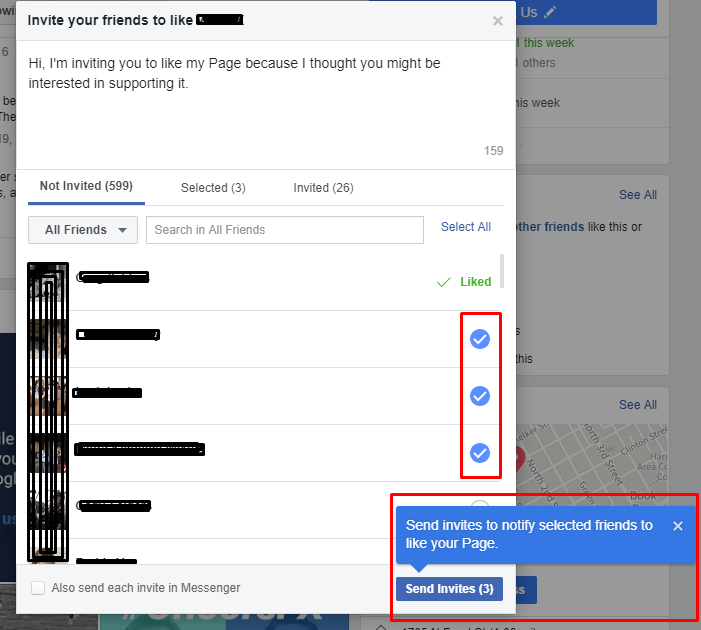 Information about upcoming events or new products: Facebook is a great place to tease new products and post about events that you might be hosting. The platform is all about word of mouth, so if you can get your followers excited about something, they’re more likely to share it! Take a look at how excited Bouqs customers get when they hear that it’s time for new Spring varieties! To share your content, users could share the entire post on their page, or tag friends in the comments like this example. When we talk about posting what users want to see, the kind of content isn’t the only thing to consider — you should also consider who you’re posting for, and who you want to attract with your content. For example, if you know that your key demographic is 30-something women, produce content that they would enjoy and uniquely relate it to them. One of the most beneficial tactics to employ in your Facebook strategy is ads. Facebook’s ad platform is a cost-effective way to attract more customers to your website and make more sales year over year. The platform is simple to use and allows you to target users based on location, demographics, and more. The granular nature of Facebook ads means that you’ll only receive clicks from users who are truly interested in your products, which is one of the reasons it’s so cost-effective. Another reason is because you set the budget for each ad, and the platform will never surpass your set amount. This means you’ll always know exactly how much you’re spending on each campaign and makes it nearly impossible to over-spend. Even though our simple Facebook marketing strategy is extremely basic, if you’re not familiar with the platform, it can be a tad overwhelming. We understand, and we’re here for you! At WebFX, we have over a decade of experience working with clients on social media marketing campaigns just like yours. Over the years, we’ve published more than 165,000 client social posts on multiple social platforms including Facebook. Our social media specialists are truly industry experts and take pride in keeping up-to-date with all things social media. We’ll be able to help you work through your Facebook marketing strategy in order to drive real results for your unique business. We know that no two businesses are alike, which is why no social media strategy is the same. To learn more about WebFX and the social media services we offer, feel free to contact us online, or give us a call at 888-601-5359!